An IPSC competitor requires several pieces of equipment in order to compete. As with any sport or hobby, there is a wide array of equipment of varying price points, depending on the competitors tastes and budget. IPSC competitors use different types of handguns dependent on the division that they are competing in. Regardless of division, all handguns must comply with Australian laws which primarily mean a minimum barrel length of 120mm and a maximum of 10 rounds magazine capacity. There are 5 IPSC Divisions; Open, Modified, Standard, Revolver and Production. 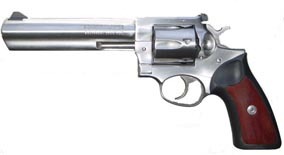 For Australian purposes, Modified Division is effectively non-existent, mainly due to the laws regarding minimum barrel length. Competitors are free to choose whichever Division suits them. Traditionally, Standard and Open Divisions are the most common as they represent the racing aspect of the sport. 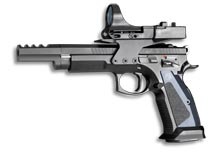 However, recently there has been a swing in popularity towards the Production Division, due not only to the lower cost of equipment but also the increasing availability of fine Production handguns; some off the shelf models are now equaling or even exceeding the capability of more expensive custom handguns. 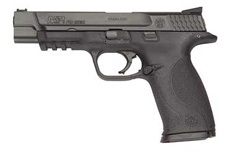 Production Division competitors use “off the shelf” semi-automatic handguns, with minimal modifications or additions allowed. 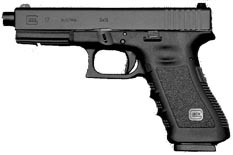 A key restriction is that handguns must be of a Double Action type, although this has been extended to include Glock Safe Action and similar striker fired designs, which until recently have dominated the Division. 9mm is a very common caliber, however .357 is also available. 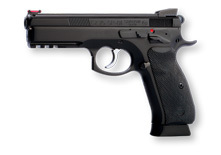 Standard Division handguns can be of any automatic type and have a wider variety of modifications applied to improve performance. 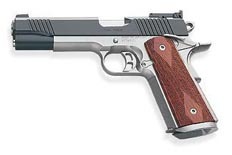 Dominating this division is the 1911 and variants, due to the Single Action only firing mechanism which provides an improved trigger. 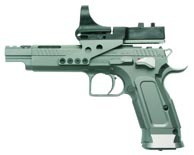 However CZ, Tanfoglio and other brands competition models are equally viable. 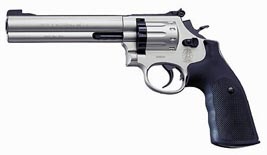 .38 is the common caliber however 9mm is also available. The Revolver Division is quite similar to the Production Division, with a little extra flexibility for modifications. As the name suggests, only revolvers are allowed. Generally these are modern types in .357 and .38 calibres. Open Division lifts almost all the restrictions from the other Divisions and allows modifications such as compensators, electronic optics and full house gunsmithing to reduce trigger pull to the bare minimum. 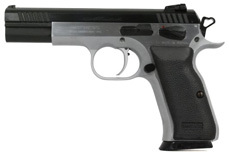 Open Division guns are sometimes referred to as “race guns” which is a good indication how far removed they are from their Production Division cousins: if a race gun is like a sports car then a Production handgun is akin to a common sedan. .38 Super is a common caliber as it safely allows competitors to achieve Major power factor for a scoring advantage, however any caliber is available. In order to safely carry the handgun and magazines, a sturdy belt and suitable holster & magazine pouch arrangement is required. Production Holster describes any of a wide array of holsters that are worn on the outside of the belt and cover the majority of the handgun, especially the trigger. They are commonly made of durable nylon plastic such as Kydex, but can be leather or firm Cordura/nylon. This type of holster is commonly inexpensive, durable and all that is required for IPSC competition. Speed Holsters are designed especially for competition purposes. In general they only cover the trigger area of the handgun and include a locking mechanism to retain the handgun by the trigger guard and/or muzzle. The advantage of a Speed holster is that an experienced competitor may draw and aim the handgun faster. However Speed holsters are generally very expensive are not recommended for first time competitors. Note that between IPSC rules and Australian law, all kinds of concealed, shoulder, ankle and thigh holsters are not permitted. To support the holster, a sturdy belt is required. Common types are thick leather belts and nylon “duty” belts that consist of an inner belt worn through the belt loops and an outer belt that holds equipment and attaches to the inner belt with Velcro. Any type of belt will suffice provided it can bear the weight of the competitor’s equipment and provide a stable platform to facilitate drawing of the handgun and magazines. There should be minimal movement of the belt when drawing the handgun from the holster. There is a bewildering selection of magazine pouches available, from generic, military style nylon pouches with retaining flaps through to speed style units that can be adjusted to angle the magazine in a particular direction for ease of access. All kinds are viable and competitors are encouraged to use some kind of pouch not only for speed of accessing magazines during a course of fire, but for safety reasons e.g. to prevent fumbling in pockets for a full magazine with one hand whist holding a loaded handgun in the other. The Division that the competitor competes in will dictate exactly where on the belt the holster and magazine pouches may be worn. For example in Production Division, all such equipment must be worn behind the hip bone (see current IPSC Handgun Rules). Of critical importance is eye and hearing protection. A competitor will not be allowed to approach the shooting line, let alone compete, if he/she is not wearing suitable eye and ear protection. Eye protection is generally safety glasses of a high impact rating. Whilst they are not bullet proof, a high impact rating is necessary to protect against fast moving debris caused by bullets striking metal plates or gravel backstops. A wrap around design is best. Common safety glasses available from hardware stores will suffice however as with all equipment better or more suitable eye protection is available. Most gun shops will carry a range of eye-wear specifically designed for shooting purposes and these are generally better than common safety glasses as they will have a higher impact rating and better optical clarity. Also available is military specification eye protection, such as Wiley X and ESS glasses. A good feature to look for here is interchangeable lenses, so that the competitor may swap between dark, light and clear tints to suit the light condition. At the top end of the scale are high performance sport glasses such as those by Oakley or Rudy Project. These are sunglasses designed with impact rated lenses, commonly used for racing bikes or other high speed sports. Hearing protection is generally divided into either ear muffs or ear plugs. Ear plugs can be anything from disposable, through re-usable to custom molded for the competitors ear. Note that off the shelf ear plugs from a hardware store or even pharmacy are generally insufficient; they must be rated for shooting and will commonly say on the packet if they are or are not suitable. Ear muffs come in normal or electronic versions. Normal ones, such as those commonly available from a hardware store, are usually sufficient but it is worth spending a little extra to purchase a better than average pair, if only for the comfort factor. Another tip is to “double plug” which is to wear ear plugs as well as ear muffs. This provides excellent protection but can be cumbersome and uncomfortable on hot days. Electronic ear muffs have special noise reduction circuitry embedded in the ear cups that will automatically detect sound over a certain decibel level and instantly react to lower the noise to a safe level. At the same time, they provide an amplification effect so that the competitor can wear them and continue to hear range commands, conversations and other sounds. This is often the best solution however comes with the drawback of being battery powered; eventually the batteries will run out! Electronic ear protection is available through hardware stores as well as gun shops, SSAA and online retailers. Once again, the models available from hardware stores are sufficient but usually inferior to those specifically designed for shooting. 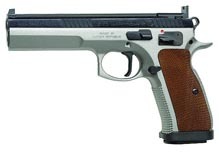 Each competitor is responsible for supplying their own ammunition of a suitable type for their handgun. Factory ammunition is available for purchase through good gun shops. Several reputable brands are available including Federal and Winchester. Another retail option is to purchase factory reloaded ammunition, re-manufactured from spent casings and generally cheaper than new ammunition. Many competitors choose to reload their own ammunition. To do this, they collect their spent cartridge cases and use special equipment to replace the spent primer, refill with gunpowder and seat a projectile. Reloading had several advantages including the ability to tailor the ammunition to best suit the handgun and competitor as well as reducing the cost of each round of ammunition. However reloading has an inherent risk attached due to the fact that the competitor is dealing with explosives and there is always room for error. It is strongly recommended that new competitors seek lots of advice before starting to reload their own ammunition. Handguns must be conveyed unloaded, with the ammunition kept in a locked container separate from the firearms. They must be rendered temporarily incapable of being fired (eg the use of trigger locks) or must be kept in a locked container that is properly secured to, or is within the vehicle. Finally, it is a good idea to come to the range prepared with some useful items such as a pen and paper, sunscreen and insect repellant and a bottle of water.